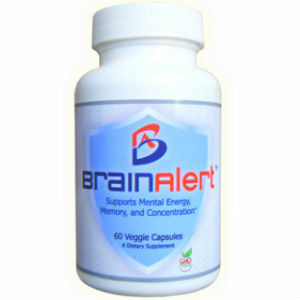 This review of the supplement Brain Alert will give you an insight into how this product works and how it can help people who suffer from a faulty memory. The supplement is supposed to enhance brain activity and increase energy levels. The manufacturer advertises the product as being able to increase reaction time, improving both short and long term memory, relieve stress and anxiety, while protecting the brain from free radicals and improving blood circulation to the brain. Read on to learn more details about this remedy and to also find out our opinion about it. The label states that the recommended dosage for this dietary supplement is of two capsules. Unfortunately, it seems to fail to mention if it’s two capsules a day or two capsules twice or three times a day. The manufacturer also forgot to mention when is it best for customers to take this supplement: whether in the morning, in the afternoon or in the evening. The price of a Brain Alert container is of $34.95. There are 60 capsules in each bottle but given the unclear dosage instructions, we were not able to determine how long one container would last. The good news here is that the manufacturer does offer free shipment for customers who have ordered more than two bottles. One positive aspect of this dietary supplement is that it does come with a guarantee. The producer advertises that unsatisfied customers can get a full refund. Details regarding this refund and the return are completely missing, though. And when it comes to customer reviews, the situation is equally dramatic. This remedy has just one customer review which is an appraisal of the product, which led us to believe that it may be just the opinion of an employee. To sum it up, Brain Alert is, first of all, a natural supplement and therefore, safe to use. The cost seems to be another plus since the producers really do have competitive prices. Nevertheless, the unclear information about the dosage and the missing information about the guarantee may convince you that there could also be better products on the market. Henry Costa	reviewed Brain Alert	on November 15th	 and gave it a rating of 3.